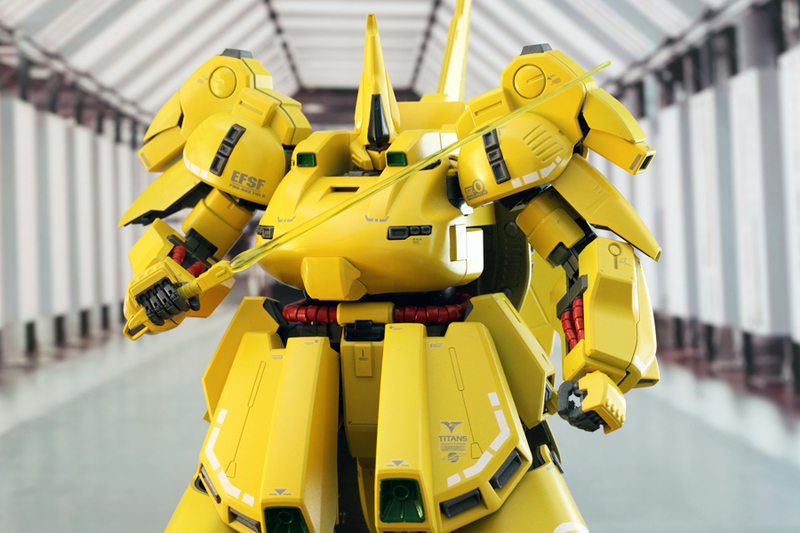 As much as I love the Zeta Gundam anime series and most of the excellent designed mobile suits, one of the designs I can’t stand is the Zeta Gundam itself. I can’t really describe it, but it just looks plain looking compared to the other mobile suits in the series, especially the strange but awesome mecha of the Titan antagonists. Suffice to say, I’ve never purchased the Zeta Gundam, however one of its alternative forms (not shown in the TV series) is coming out this September. 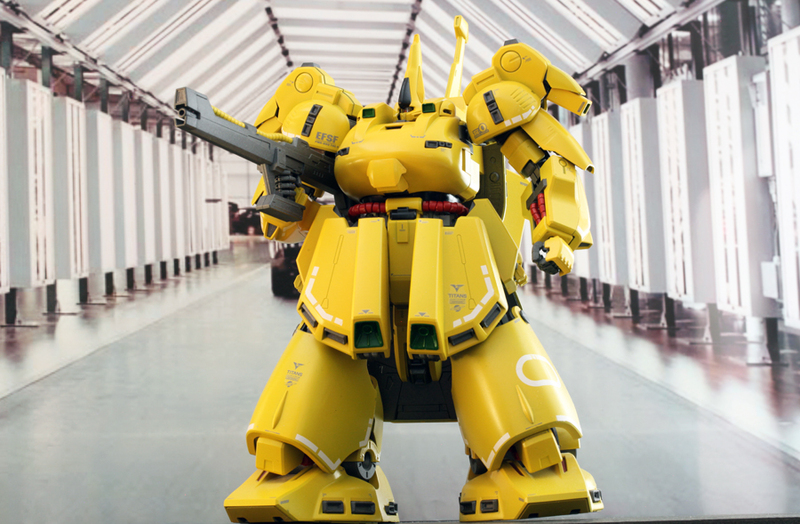 Dubbed the Z II, this variation of the Zeta Gundam mobile suit appeared in “side stories” either through the manga or video game medium. 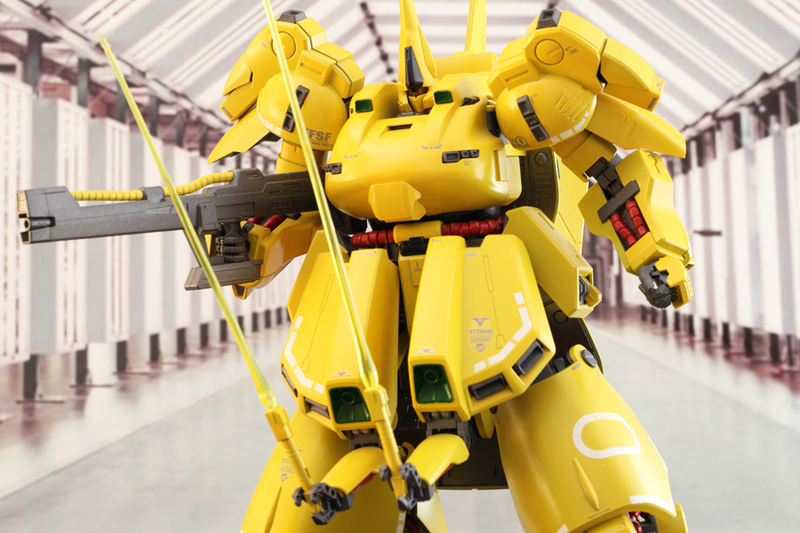 I’ve seen this design before when Bandai produced it for its Gundam Fix Figuration Figures many years ago, and it looked terrific! I would’ve purchased it, but the GFF series was known to have loose parts and issues with poseability. But now the Z II is being released soon for the High Grade series, and I am definitely on board. I love the colors of the kit and accentuated armor features and weapons. 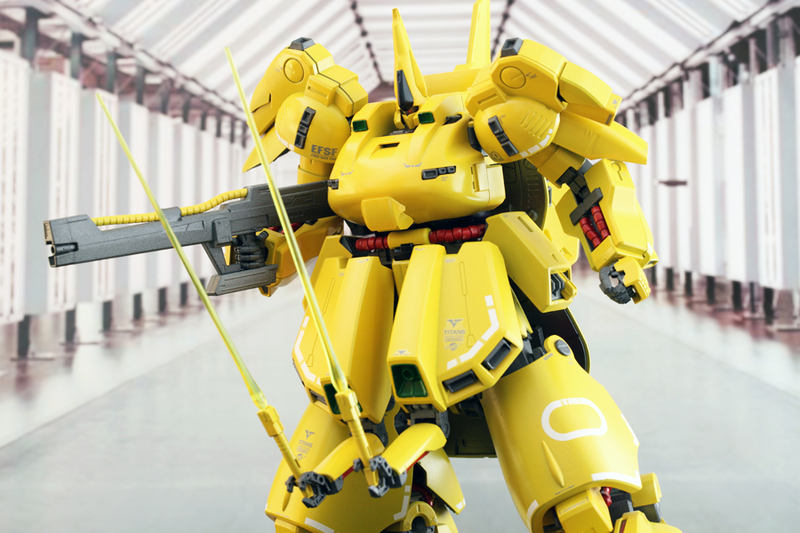 I am looking forward to getting this kit ASAP! 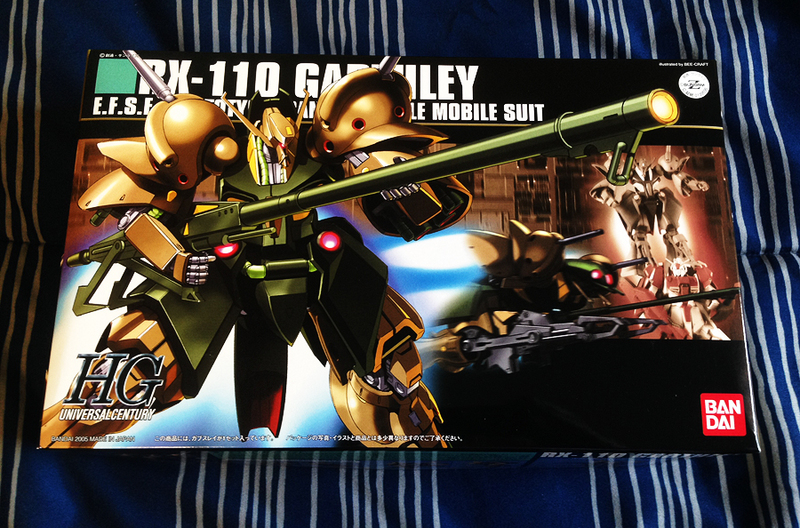 The HGUC RX-110 Gabthley model from Zeta Gundam. 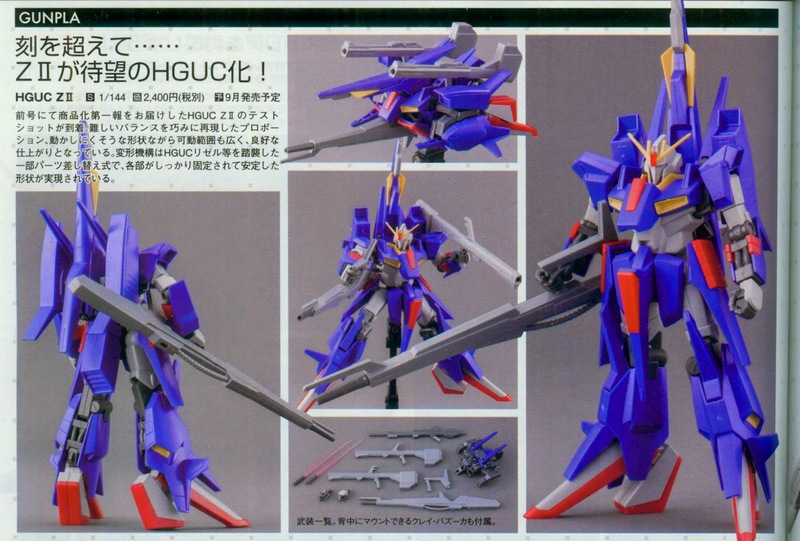 The High Grace Universal Century RX-110 Gabthley Gundam model came out in the winter of 2005 and is based on the mobile suit featured in the 1985-1986 animated series Zeta Gundam. 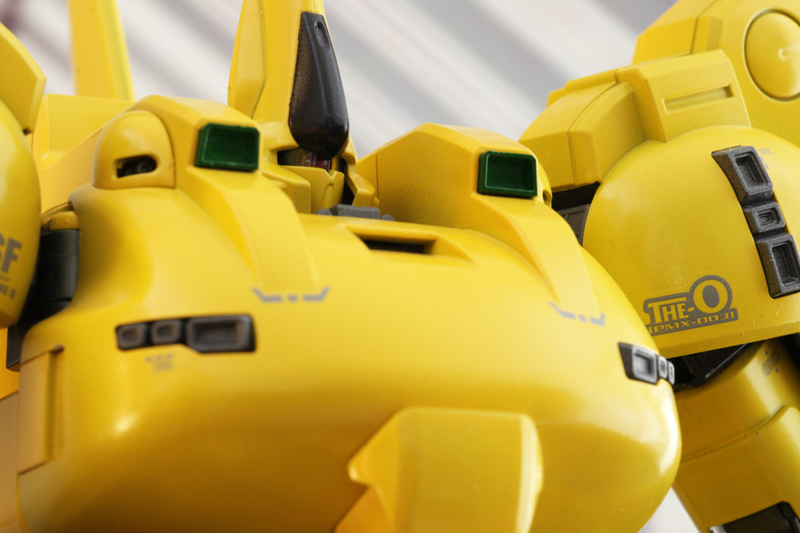 The Gabthley was piloted by Titan pilots Jerid Messa and Mour Pharoah, and was featured in several episodes mainly near the mid-point of the anime series. 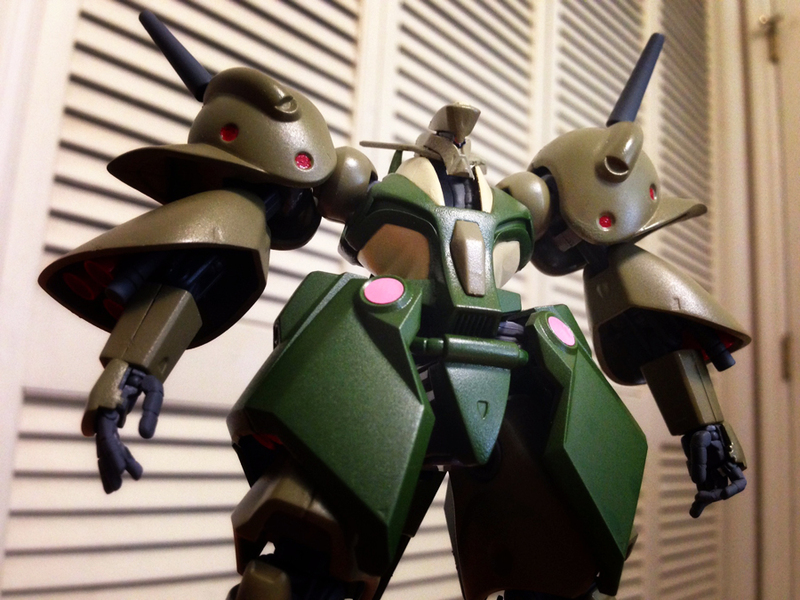 The mobile suit is notable for being one of several transformable mobile suits in the series; transforming from its mobile suit form to a “mobile armor” which resembles an insect. 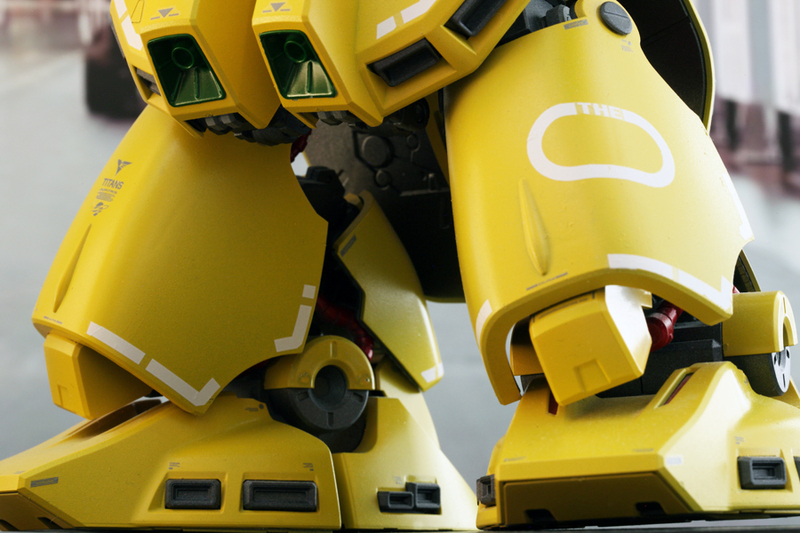 The HGUC model retains that aspect with the Gabthley able to change forms. 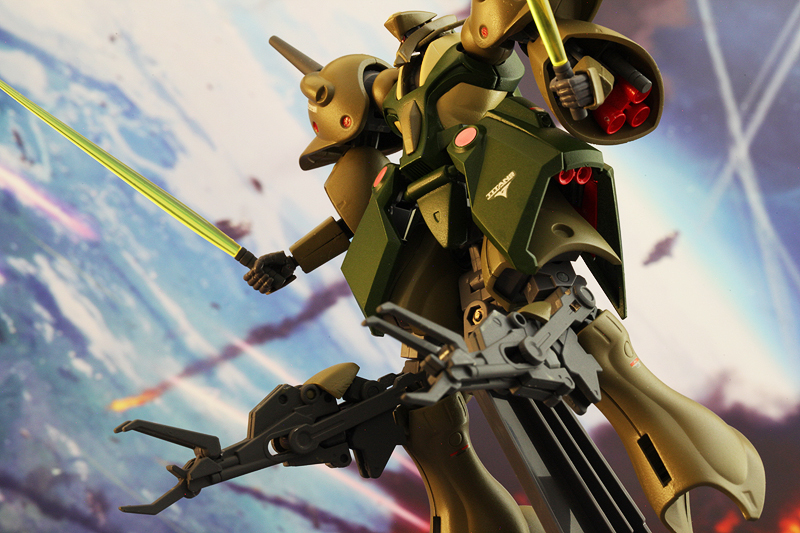 The Gabthley model comes with a Feyadeen rifle, four beam sabers that are placed within sockets in the arms, a pair of hands that hold the sabers, a hand to hold the rifle and a stand that holds any pieces the model is not currently using. 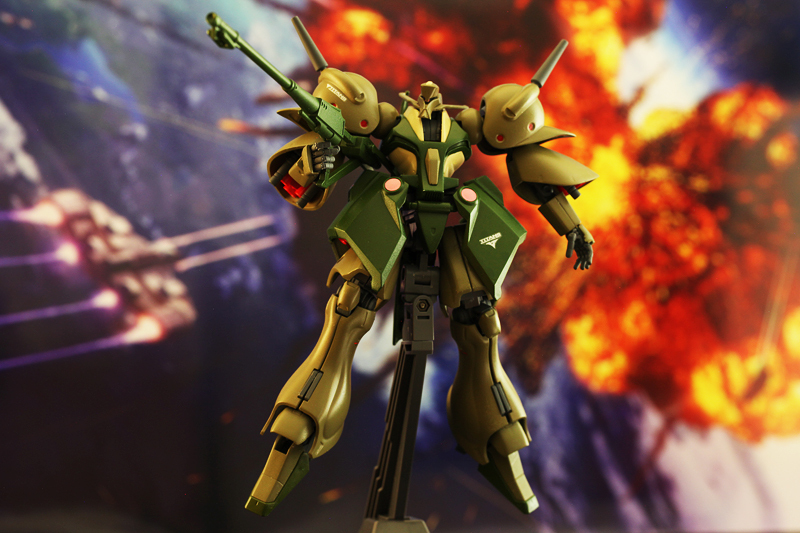 The HGUC Gabthley armed with its Feyadeen beam rifle/saber. 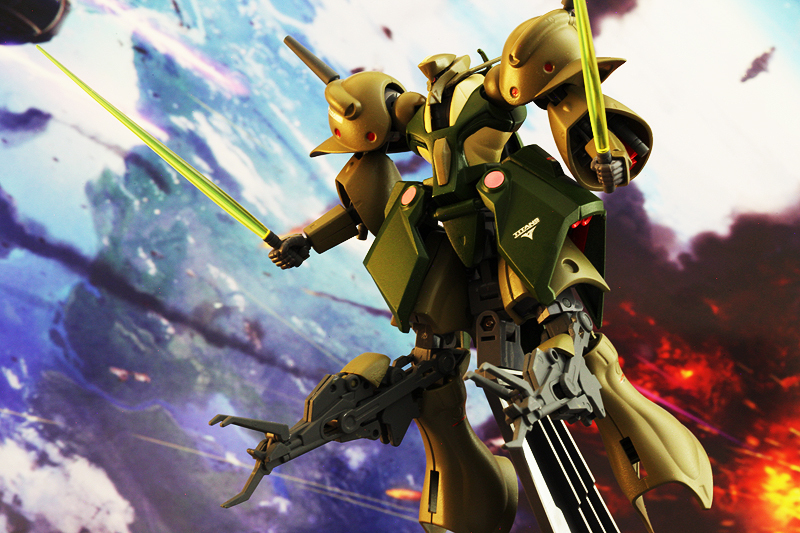 The HGUC RX-110 Gabthley armed with two of its beam sabers. 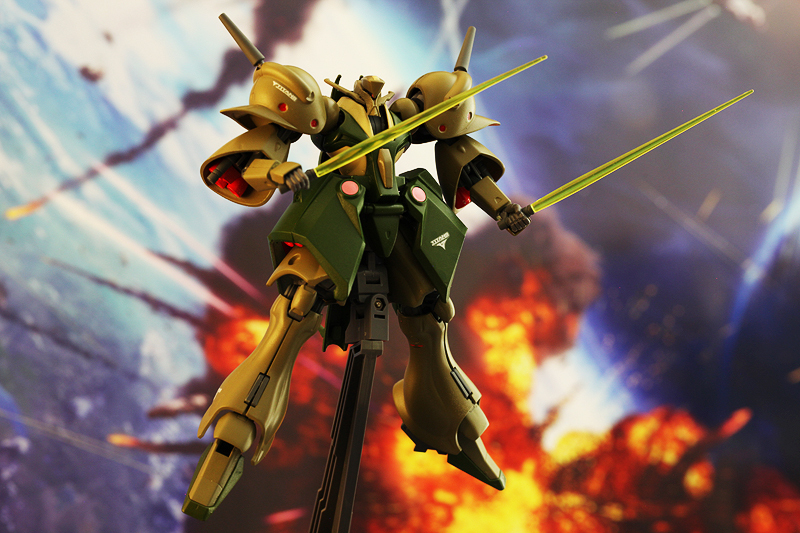 HGUC RX-110 Gabthley with Feyadeen beam rifle/saber. 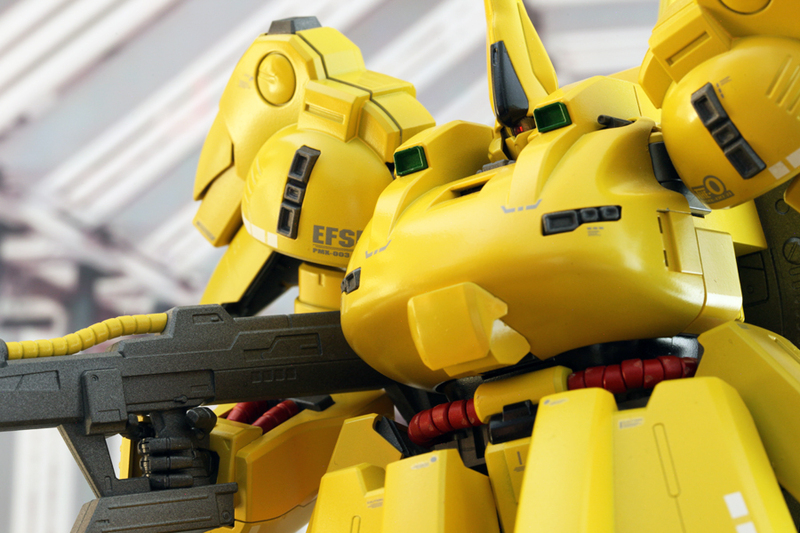 The design of the model is amazing and one of my top five of all time for Gundam. 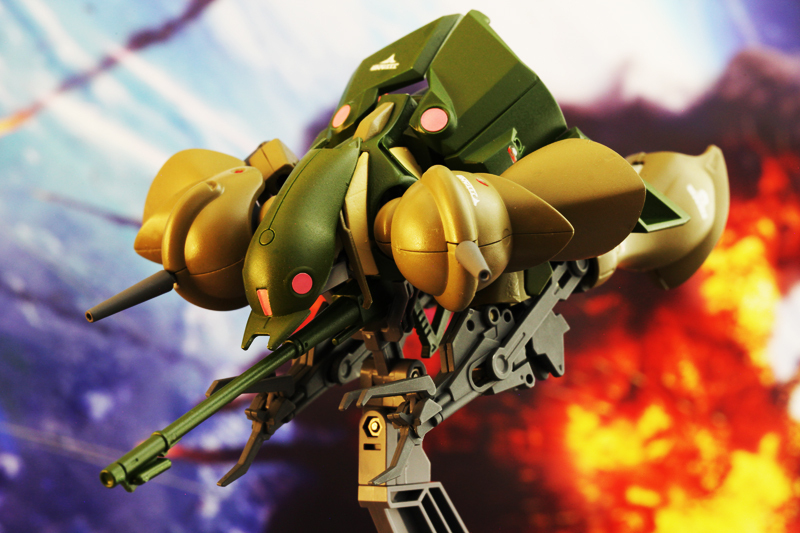 Zeta Gundam is known for its strange designs, and although it’s not an over the top design (like The-O or Messala), the Gabthley doesn’t look like your ordinary mobile suit with its slimmed down sleek look and insectoid influences, especially in its mobile armor form. The model’s poseability is pretty decent for a 2005 model. 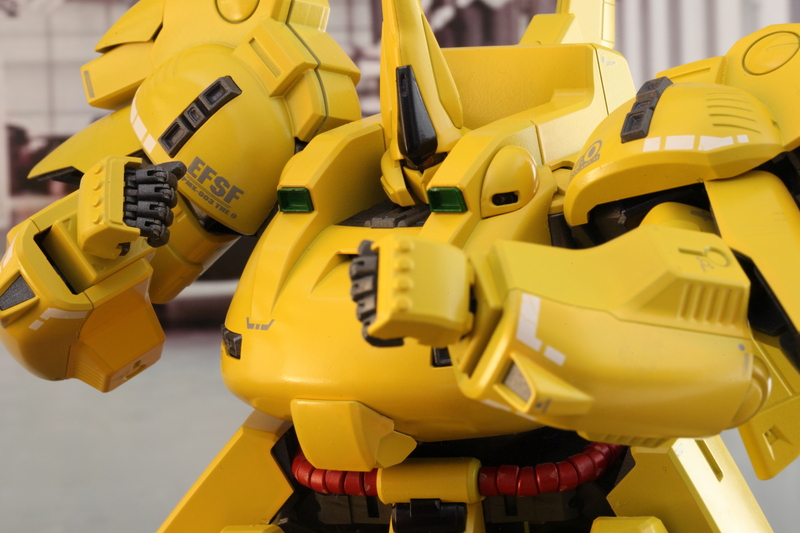 It’s good, but nowhere near where Bandai has pushed the capabilities of today’s HG kits. I was pretty surprised that the arms were very flexible to the point you can do a bicep curl. The weakest part of the model is definitely the hand that’s supposed to hold the Feyadeen beam rife/saber, made up of two parts. It falls apart very easily, and I was not able to get the hand to hold the rifle. 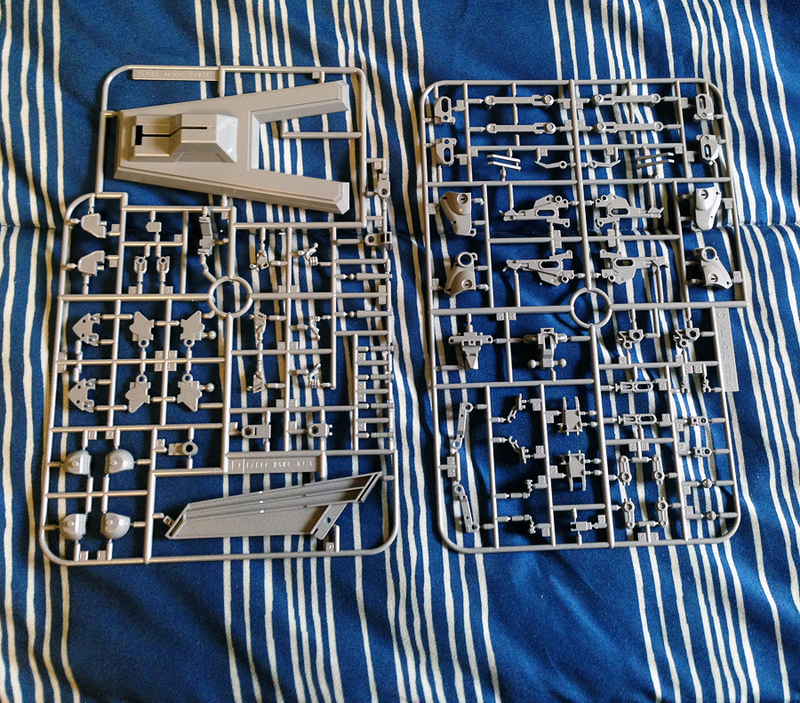 I specifically bought a third party pair of hands (Hobby Base’s mechanical hands for 1/144 models) since I knew beforehand about the problems. 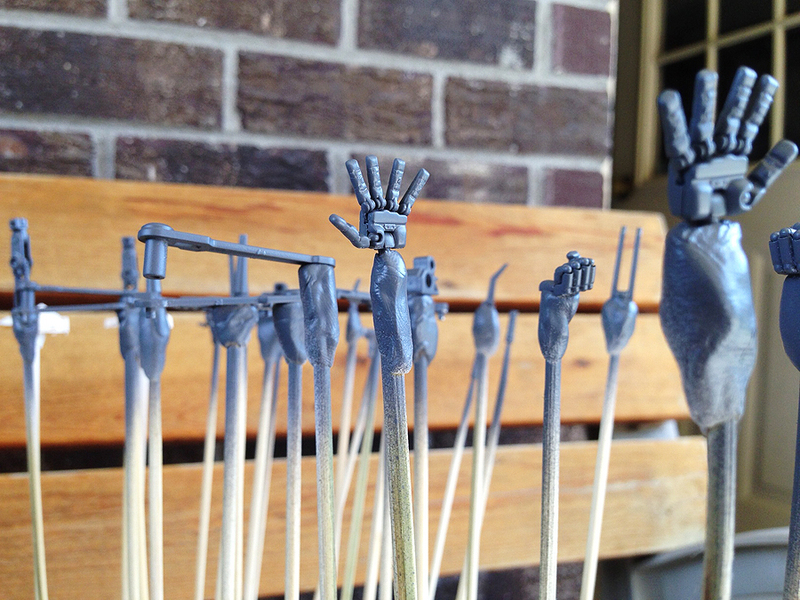 Hobby Bases’s hands are similar to Perfect Grade hands miniaturized for High Grades. 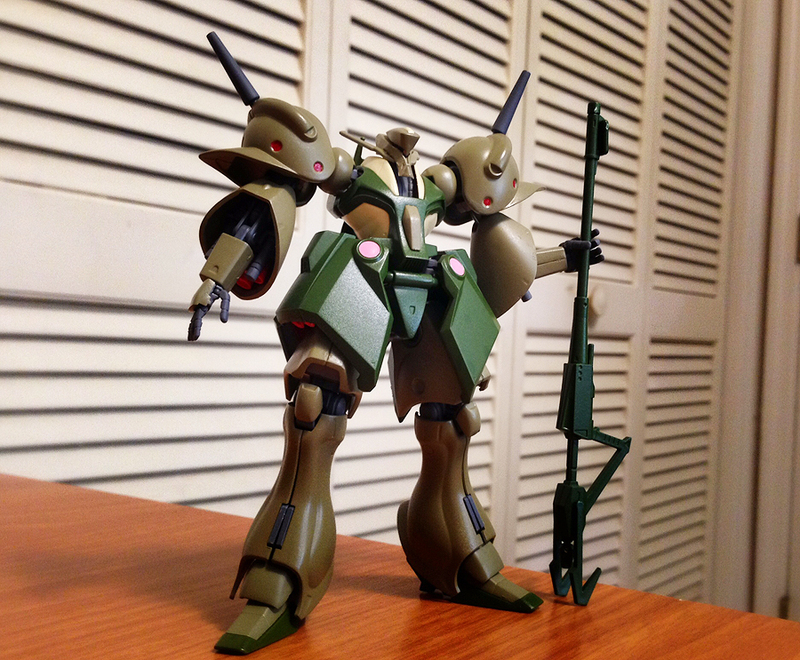 Although they are somewhat big for the HG Gabthley, they’re pretty tight and were able to grasp the rifle. It took me a lot of patience and time to put Hobby Base’s hands together, since the parts were so small, but it was well worth the effort. 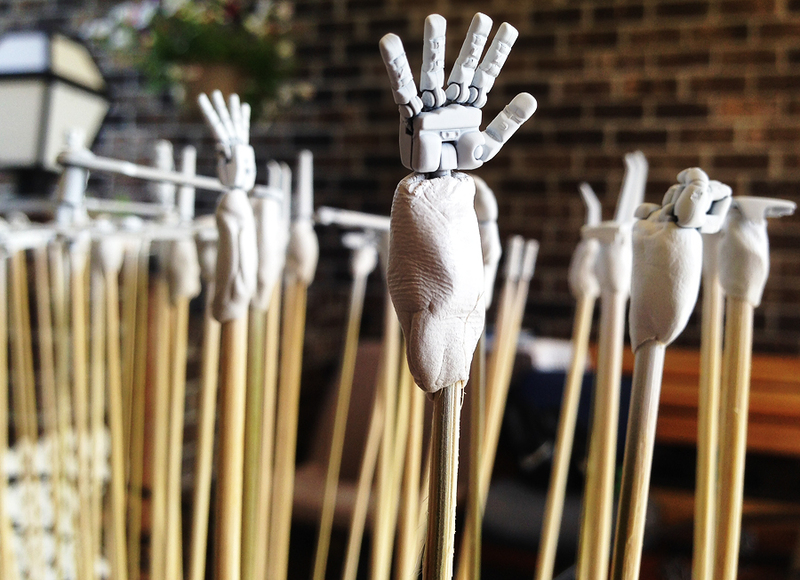 The other pair of hands that come with the Gabthley perfectly hold the sabers. 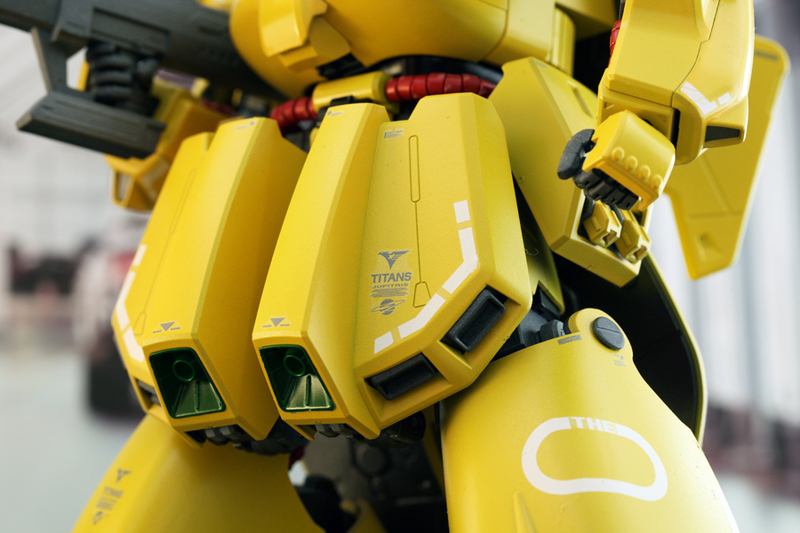 There are four sabers that are placed within the arms of the model. 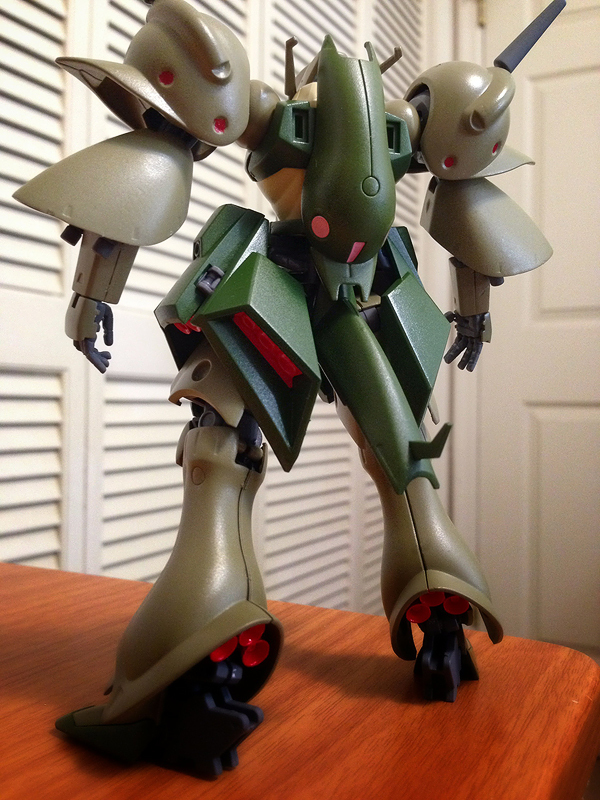 The HGUC RX-110 Gabthley in mobile armor form. 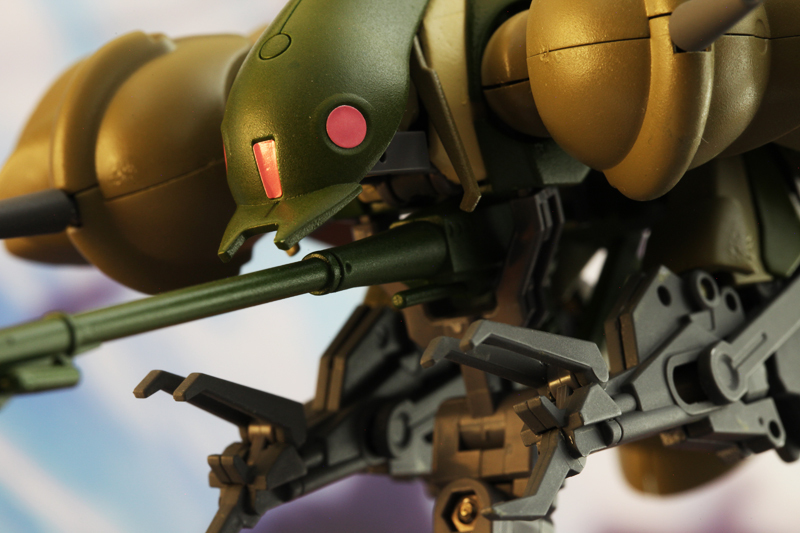 The mobile armor form of the model looks exactly like an insect complete with its circular eyes and feet which are grasping claws that look pretty neat and can be also used in the Gabthley’s mobile suit form. 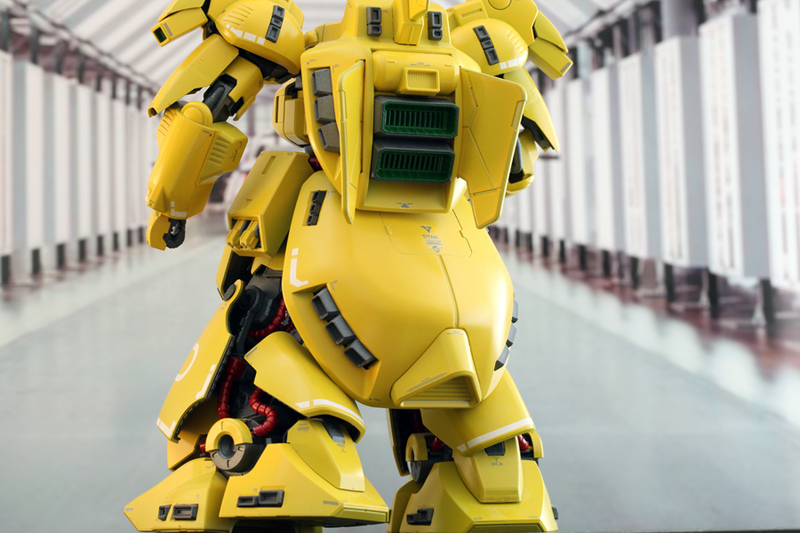 It almost looks like a robot from the Transformers series. The mobile armor form looks good, but I doubt that I would leave it in that form since I think the mobile suit looks much better. 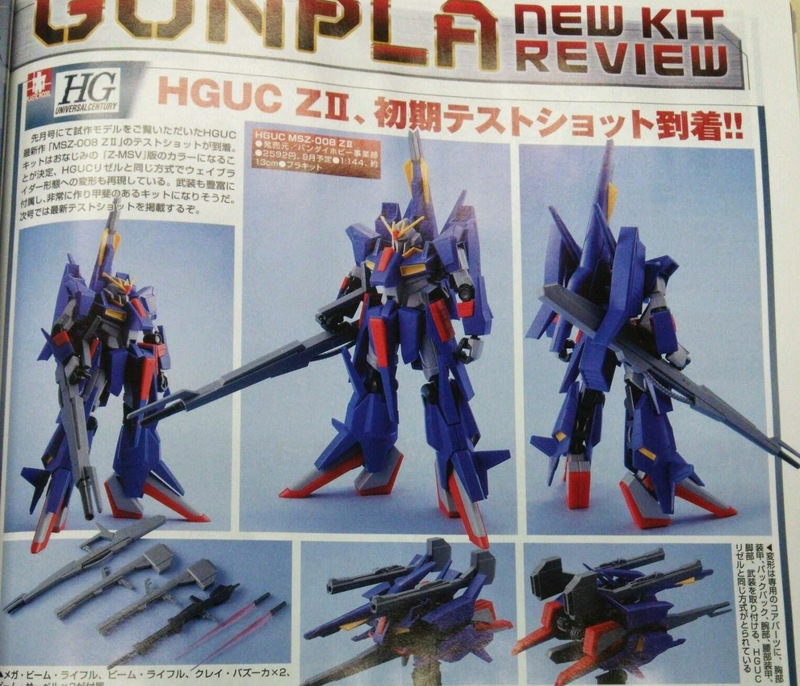 The HGUC Gabthley is a very strange looking but interesting model. 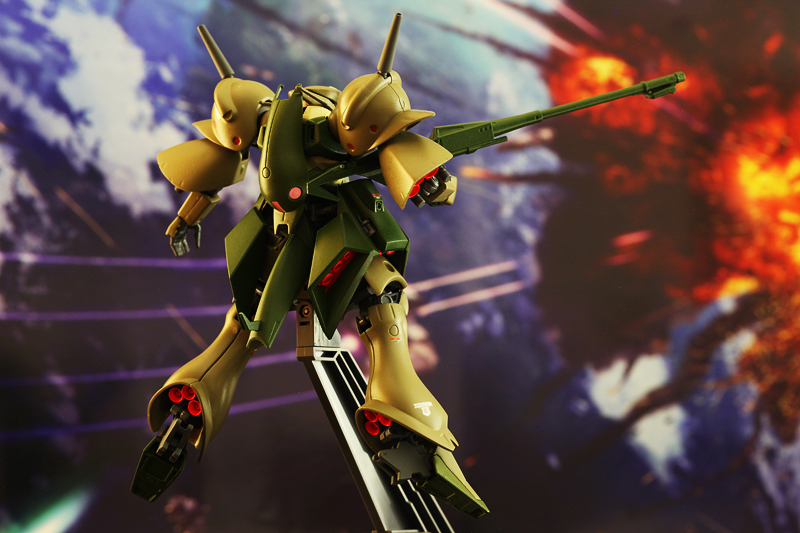 I really like the mobile suit design, and even though the model isn’t really up to par in the poseability department, there’s still a lot of various poses you can get the model in. Just don’t count on getting the hand that’s meant to grasp to the rifle to work. 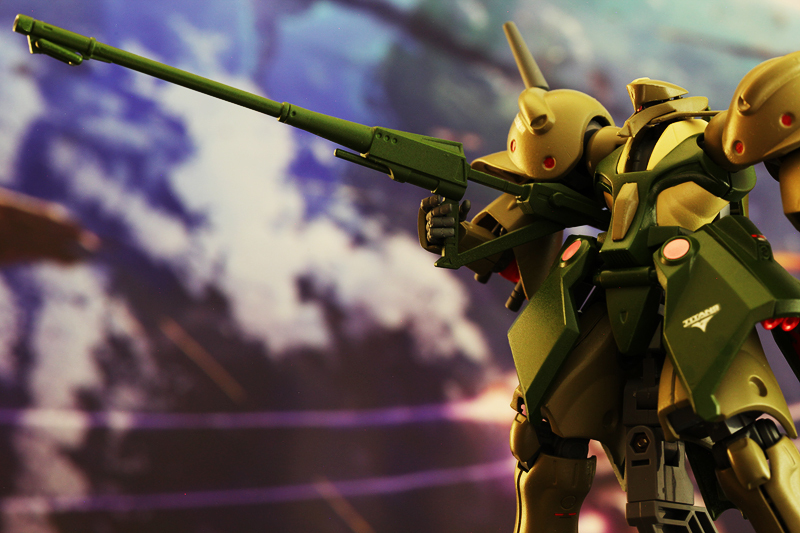 I highly recommend third party hands to get any type of decent poses with the Feyadeen rifle. 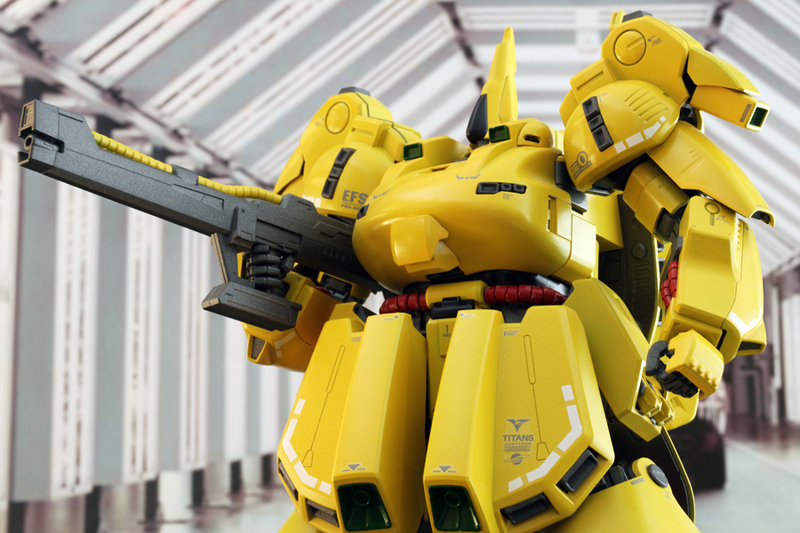 I would definitely buy a Master Grade of this kit and hope Bandai looks toward Zeta Gundam for ideas for future MGs, especially from the Titan designed suits. + Unusual and interesting design. + Ability to change forms to mobile armor mode. + Decent amount of poseability for a 2005 model. – Hand for rifle comes apart easily. Difficult to hold the weapon properly if at all. 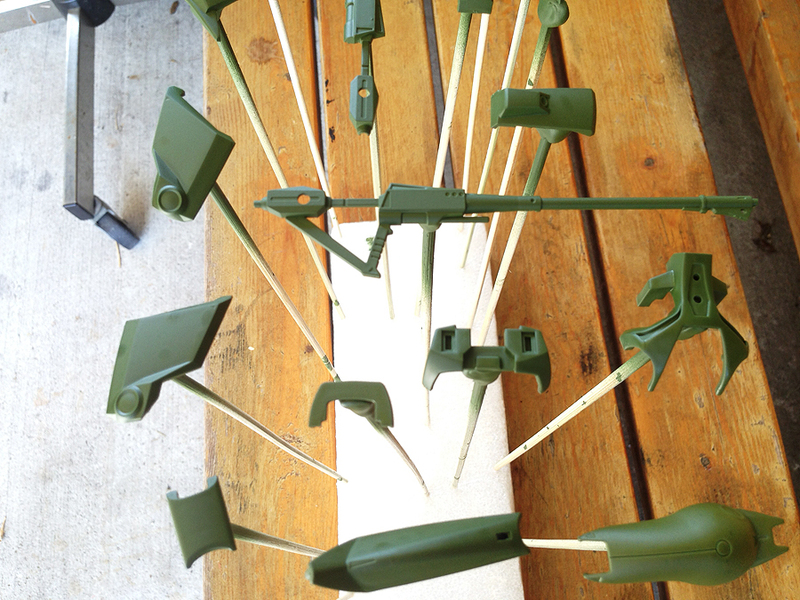 Construction of the High Grade Gabthley is complete after painting and top coating. Work now commences on touch up painting and closing gaps and seams on the model, seen particularly on the legs. The model didn’t take me that long to put together, I would say maybe just under an hour. The Gabthley looks amazing and the poseability looks to be half way decent with the arms and forearms being the most flexible limbs on the kit. 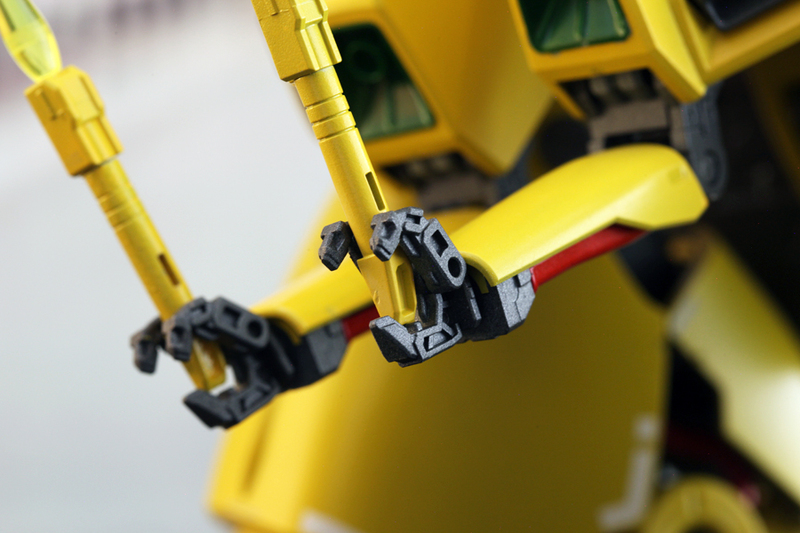 The Hobby Base 1/144 Mechanical Hands work perfectly with the kit. They are slightly bigger than the hands the model comes with, but it’s nothing that’s very noticeable. High Grade Gabthley armor plates painted. 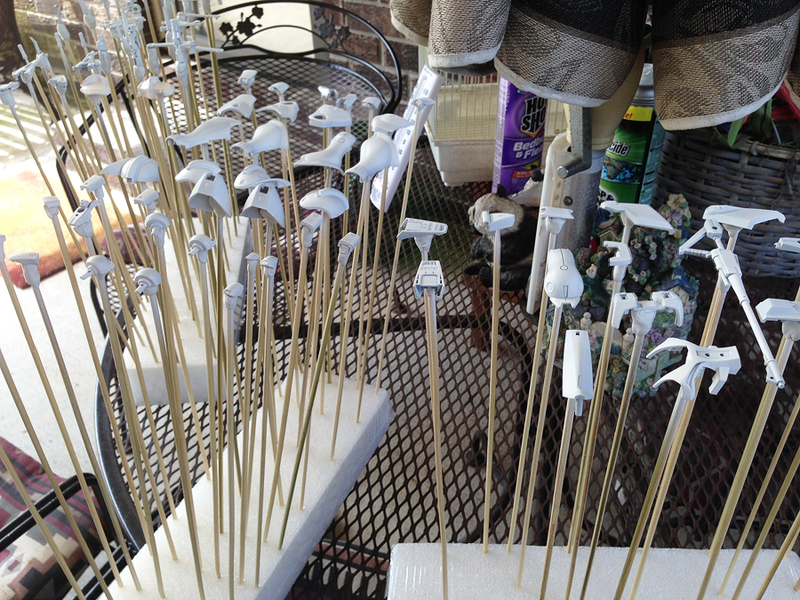 Painting and top coating on the High Grade Gabthley is finished after two days of work. For the main armor plates for the model I used a lighter paint tone than the recommended colors for the kit. 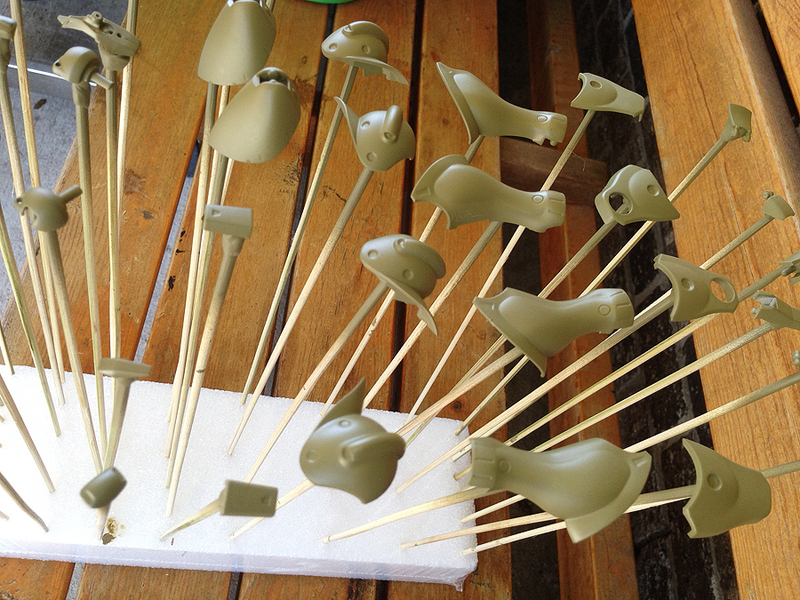 Here’s the paint and top coat I used for the kit: Model Masters Bomber Tan, Model Masters Medium Green, Model Masters Flat Sand, Model Masters Wet Look, Model Masters Dullcote, Tamiya Mica Red and Tamiya gunmetal grey. 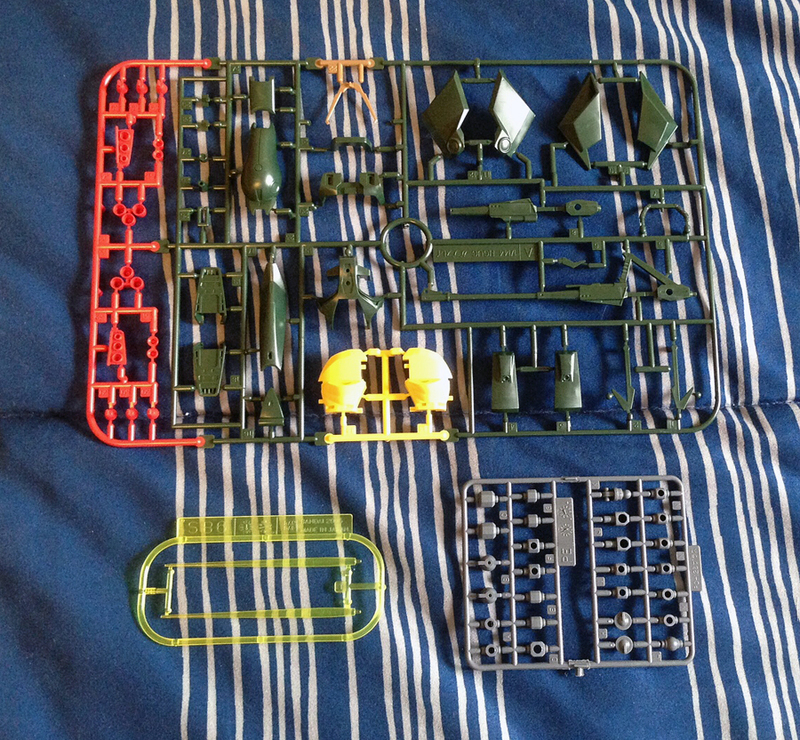 Model Masters Medium Green used for the green armor pieces of the HG Gabthley. Tamiya Light Gunmetal Grey used for Hobby Base mechanical hands that I’m planning to use for the HG Gabthley. 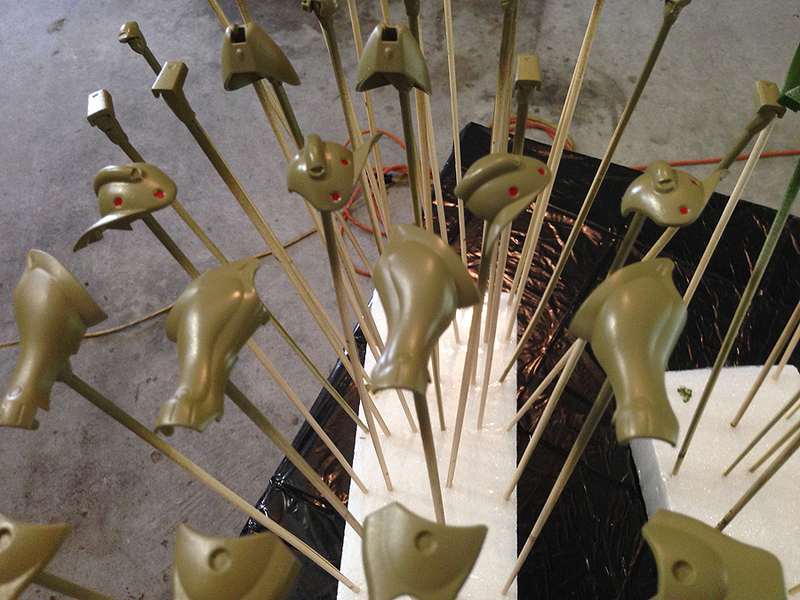 Top Coating in process for the HG Gabthley. 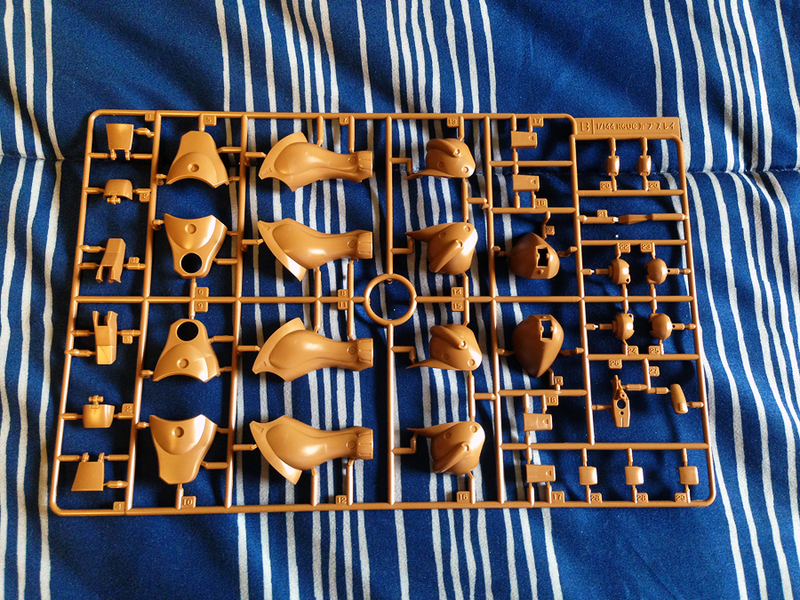 Hobby Base’s mechanical hands purchased for the HG Gabthley model from Zeta Gundam. Putting primer on the HG Gabthley parts was pretty quick compared to my past projects. I finished under about an hour and a half; it’s probably the fastest I’ve ever done a model. The armor pieces look pretty good in white but I’m quickly going to paint over them and hope to put a wet metallic finish to the completed model. 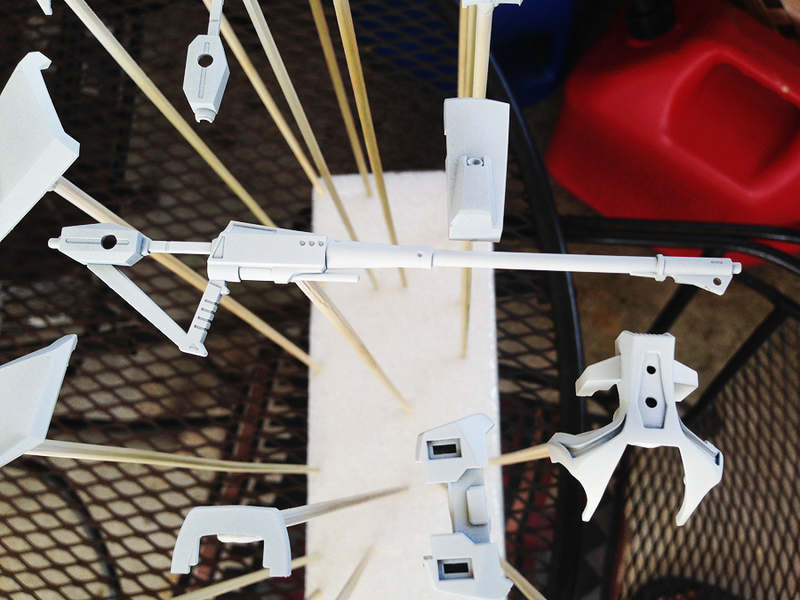 As you can see from the above picture I also primed some hands from Hobby Base’s mechanical hands for 1/144 Gundam models. They’re like Perfect Grade hands except smaller and a LOT tougher to put together since there’s small pieces involved and you’ve got to have some good dexterity in order to put it all together. But, it’s definitely worth it considering the enormous amounts of poseability they have. How they’ll hold up handling the Gabthley’s weapons? That I’ll come to soon enough and report on that. 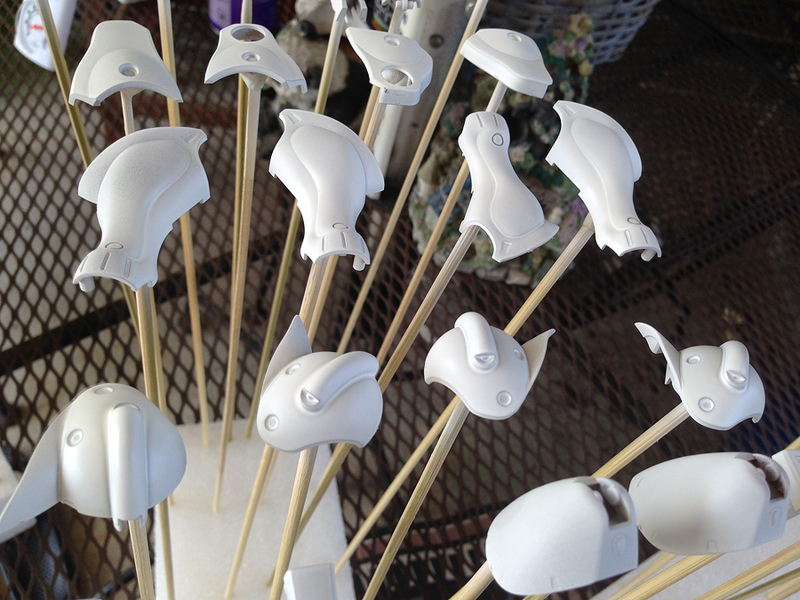 I’m pretty excited to have the parts all primed and ready to paint. A few pictures below of the progress. 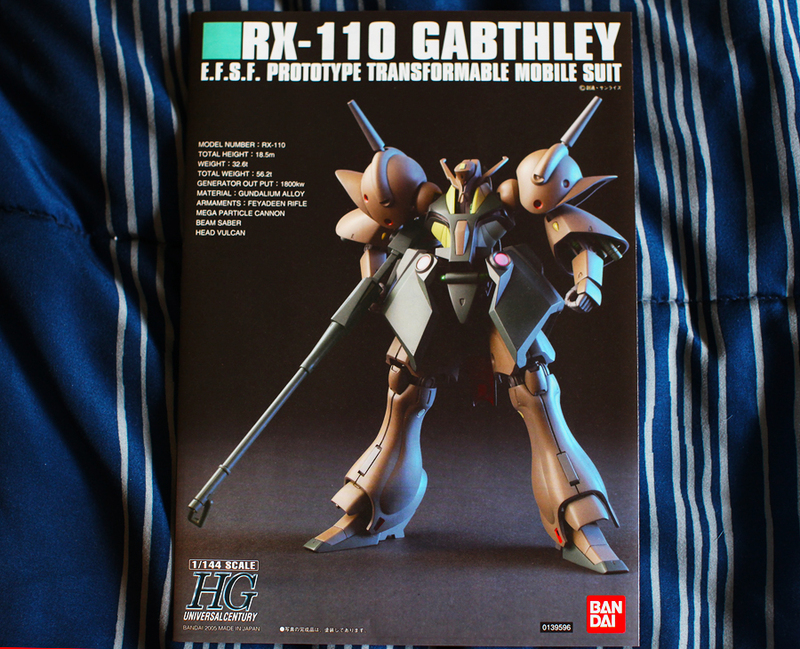 After a long absence I’m back with a new project, the High Grade RX-110 Gabthley model. 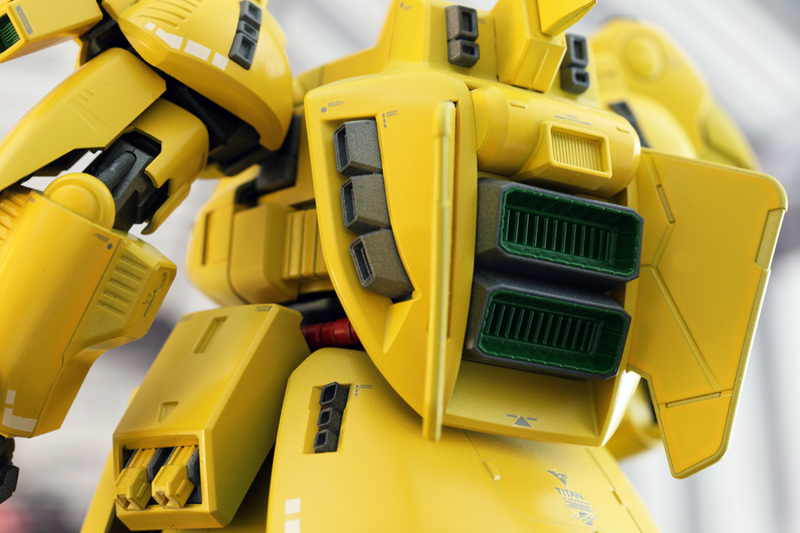 If you’ve been reading the site, you know that I’m a big fan of the Zeta Gundam animated series with my favorite mobile suit model being the HGUC Messala. 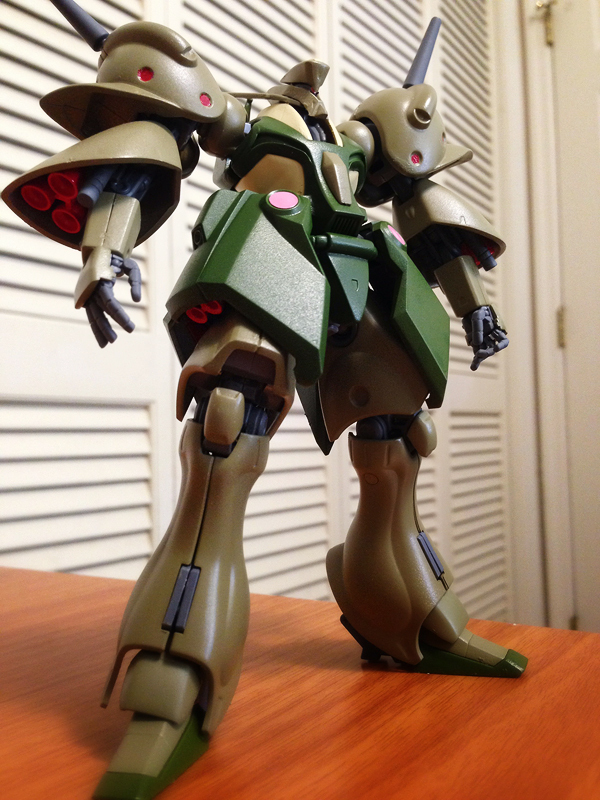 I decided to continue purchasing more models from Zeta Gundam with the Gabthley whose design is just as unique and strange as the Messala. 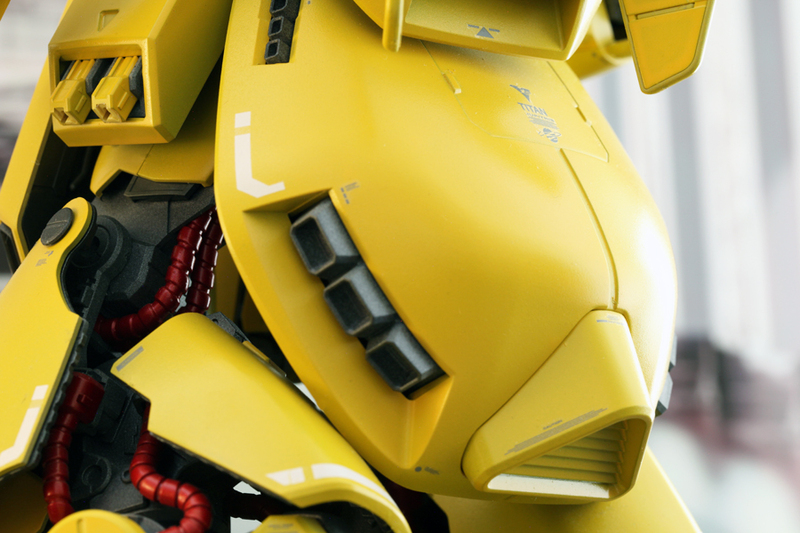 And like the Messala, the Gabthley can transform into a mobile armor form which looks somewhat like an insect. In addition I’ve purchased some Titan decals and Hobby Base’s Mechanical Hands since I’ve read and seen past reviews of the Gabthley stating that the hands are pretty bad on this model which originally came out in 2005. HG Gabthley plates for the stand, inner frame and hands. 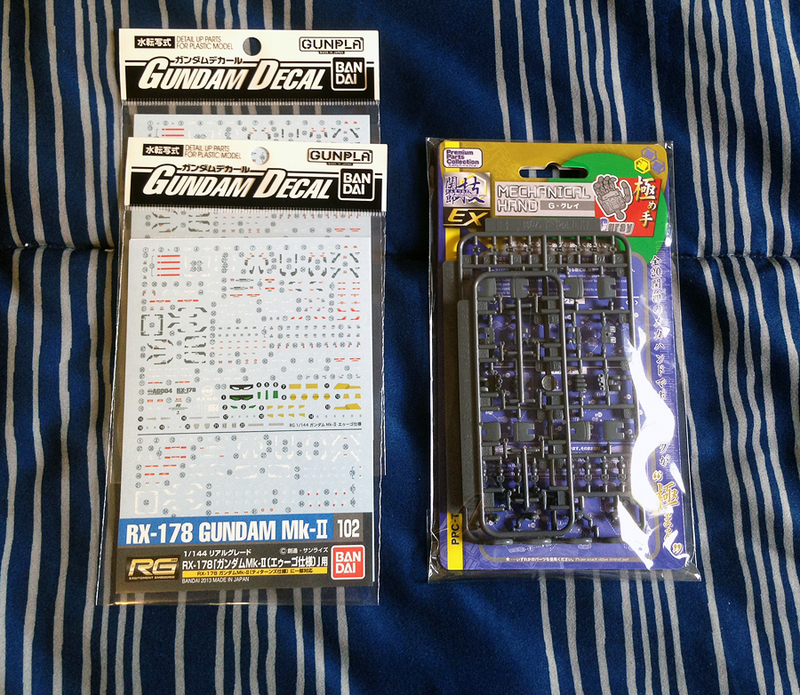 Additional accessories for the HG Gabthley I purchased including Titans decals and Hobby Base’s Mechanical Hands for 1/144 models.